It’s birthday week in our house. My baby boy turns six on Saturday, which means the birthday celebrations started on Monday of this week. When you’re six, there are a lot of people who want to celebrate with you: classmates, teachers, grandparents, friends, and mom and dad! To kick off the celebration, Piper’s Montessori class hosted a morning celebration for him during circle time. During the twenty minute celebration, the kids sang about the seasons and months. Then, after spreading out a giant carpet resembling the sun, Piper walked around the “sun” while holding the Earth (well, a miniature globe) for each year he’s been alive. After each passing, representing one year of his life, Dustin and I were asked to share a memory from that age. After the walk around the sun, representing six years of life, and a really cool lesson about the seasons and months, Piper shared his favorite snack with his classmates: homemade applesauce muffins and cheese sticks. And guess what? The kids loved the applesauce muffins. Yep, they loved whole wheat flour, oats, and honey! Later in the week, we plan to celebrate with a barn-themed birthday party with a few close friends and family. When it comes to parties, I tend to have this over-achieving habit to recreate an entire Pinterest board in real life. This year, I’m holding myself back, and trying to remember that perfection isn’t what a birthday party is all about, nor is it about the cutest little invites or table decor. This week is about celebrating my “baby” boy and the amazing six years we’ve enjoyed together so far. So, friend, this is my accountability check: I will not go overboard on this party. I’m going to enjoy this week, and keep things simple and enjoyable (AKA: stress-free). 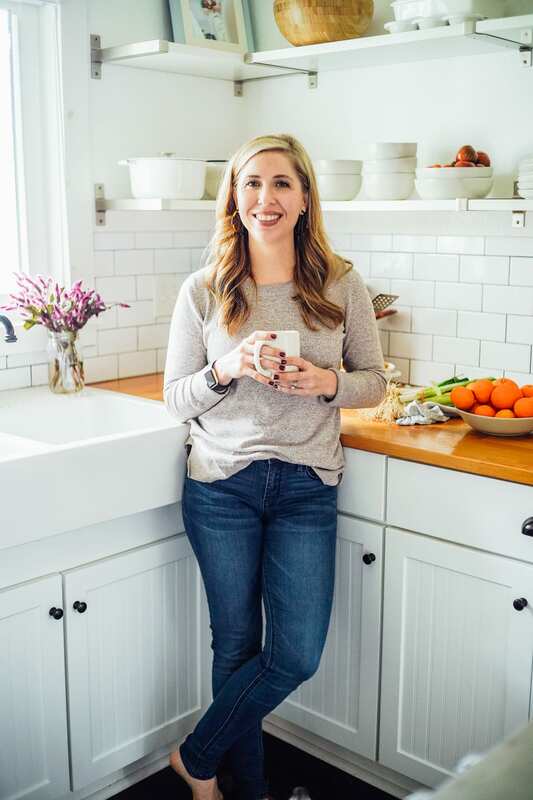 Today’s recipe has nothing to do with Piper’s birthday, other than the theme of keeping life simple and enjoyable. Hey, I tried to bridge the gap between the two ;). 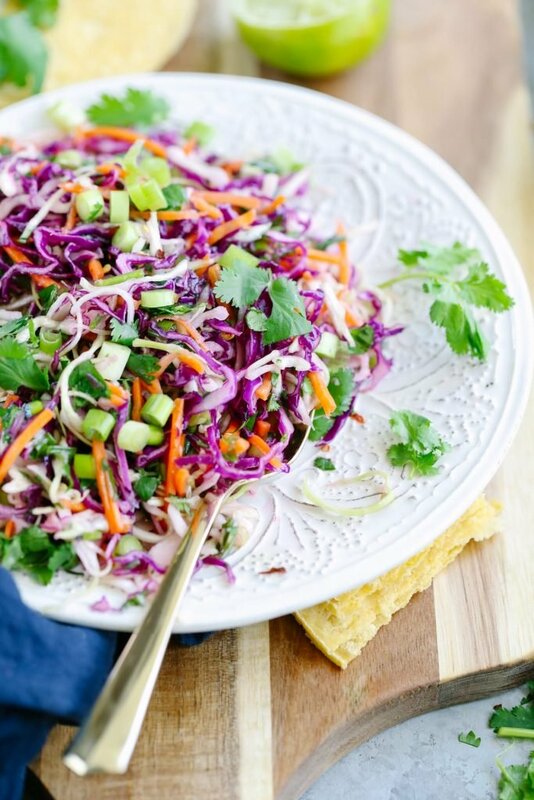 This Cilantro-Lime Slaw is the perfect example of a simple and enjoyable real food recipe. 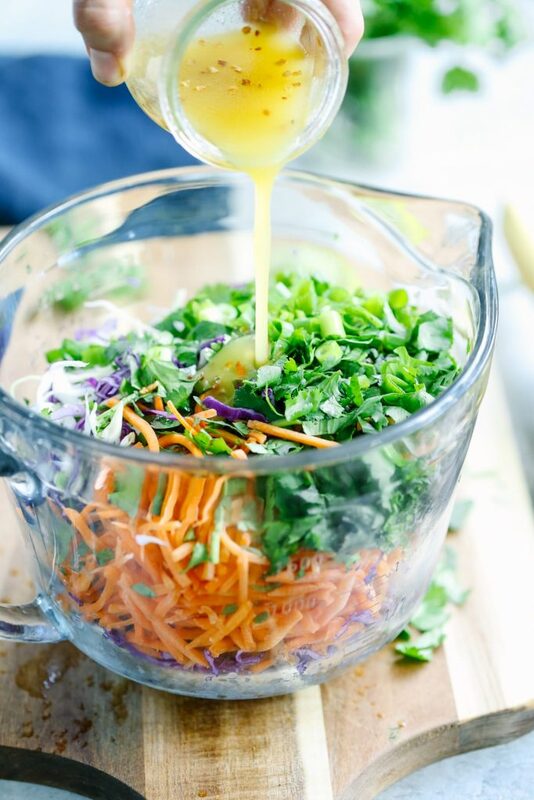 The simple combination of fresh coleslaw ingredients (cabbage, green onions, carrots, and cilantro) are combined with a dressing that takes less than 60 seconds to make. And now for the big question (because I’ve never really understood the point of traditional coleslaw…I know, that’s probably very UnAmerican to say): How in world do I use this coleslaw? Over the last few months, I’ve found no shortage of ways to use this coleslaw, from a topping on barbecue chicken sandwiches (use these homemade buns for the ultimate real food sandwich!) and tacos, to a simple side salad for black beans and rice (one of my favorite meals). Since there’s no shortage of ways to use this recipe, it’s not uncommon to find a large jar of Cilantro-Lime Coleslaw sitting in our fridge and ready to be used throughout the week with a simple dinner (like the tacos or pulled barbecue sandwiches), or enjoyed as an on-the-go lunch option. Before I share the recipe, I think a little disclosure is needed: I’m sharing this coleslaw recipe in preparation for next week’s crock-pot chicken tacos. 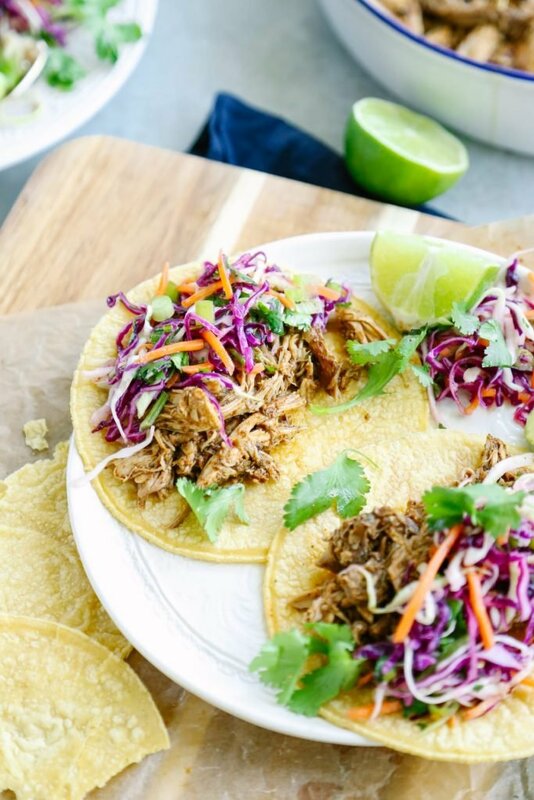 Trust me, you’ll want this slaw with the spicy taco meat and a stack of corn tortillas. Now that, my friend, is about as simple and as fresh as a meal can get! This Cilantro-Lime Slaw is the perfect example of a simple and enjoyable real food recipe. 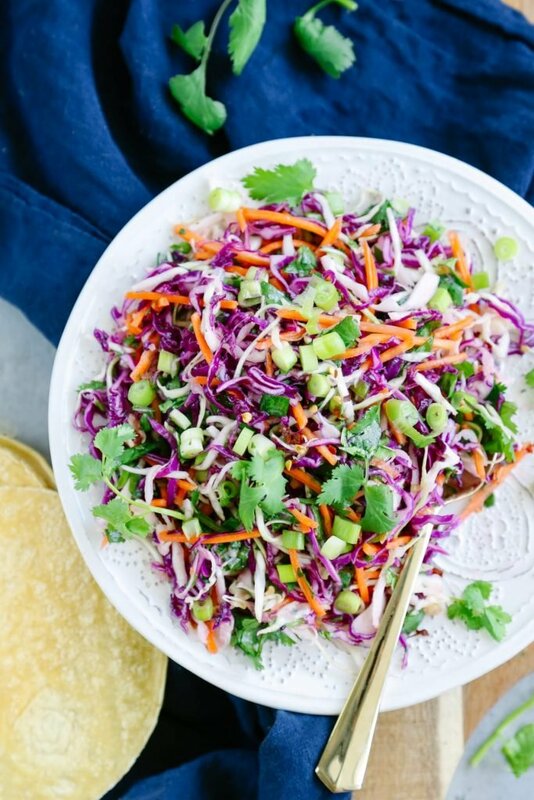 The simple combination of fresh coleslaw ingredients (cabbage, green onions, carrots, and cilantro) are combined with a dressing that takes less than 60 seconds to make. 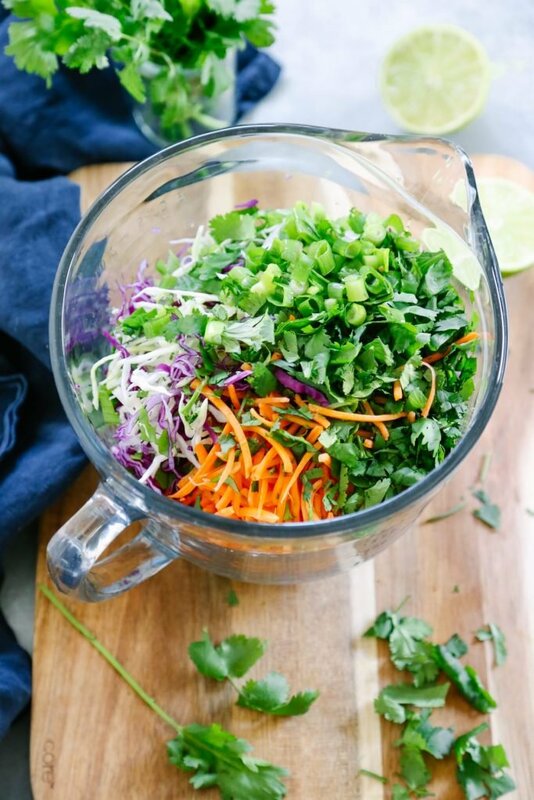 In a large bowl, combine the coleslaw ingredients: shredded cabbage, shredded carrots, chopped cilantro, and sliced green onions. 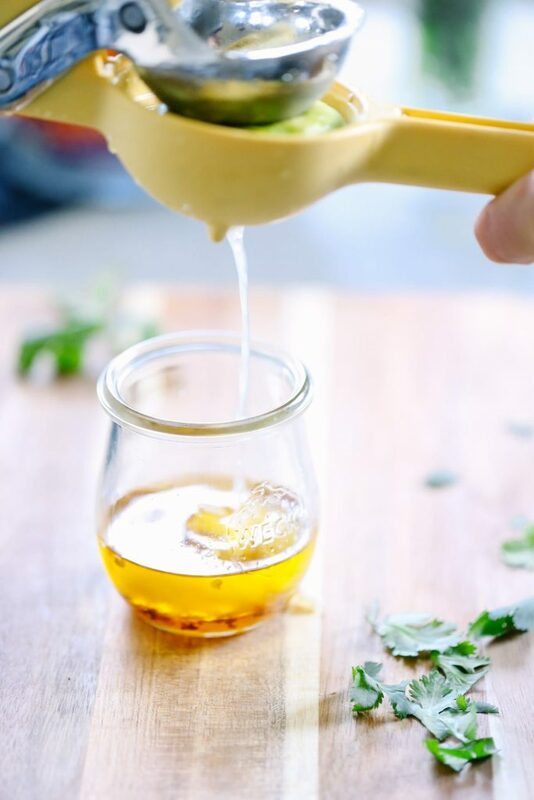 In a small bowl or jar, whisk together the dressing ingredients: olive oil, lime juice, honey, minced garlic, red pepper flakes, and salt. Pour as much dressing over the coleslaw as desired. The dressing is also delicious over a salad if you have have leftovers. Toss the coleslaw and dressing together. 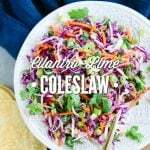 Serve the coleslaw over tacos, on sandwiches (a barbecue chicken sandwich is divine with this coleslaw), or serve as a side salad. The coleslaw may be prepped in advance and refrigerated, or used immediately after preparation. Recipe dressing adapted from the Easy Weeknight Salad. I usually add more cilantro than 1/2 cup. Feel free to add more of an ingredient to reach the taste desired. I’ve also added tangy variety to this dressing by adding 1 tablespoon of white wine vinegar to the mix-YUM! This sounds delicious. I’m really enjoying coleslaw and trying out new variations so I’ll give this one a go. Hey Kizzy, Thank you! I love that coleslaw can be made in so many unique ways! I make a version of this with coconut milk and jalapeno’s that we just love!! It’s so simple but adds so much flavor to a taco. 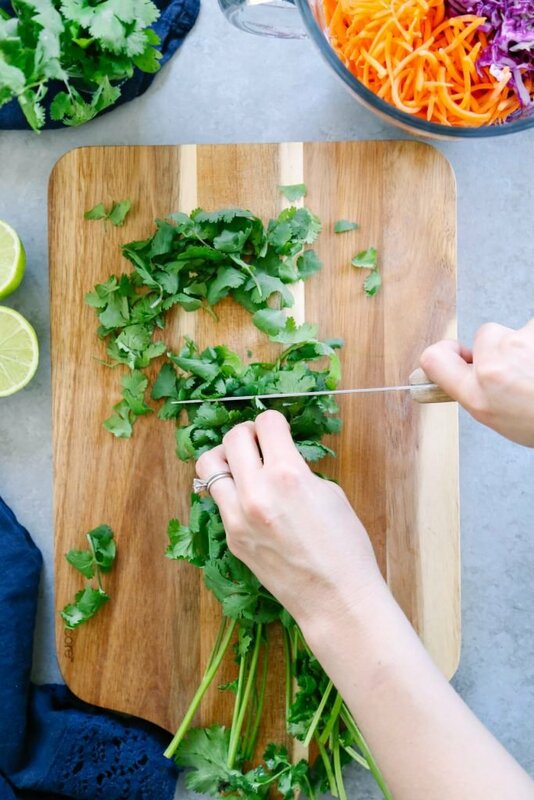 And there is nothing like fresh cilantro! Hi Janel, that sounds delicious! Would you mind sharing the recipe? This was everything I dreamed it would be! Officially obsessed. I’m so glad you loved it, Kate! Two thumbs up from myself and family!! I just made this to accompany a french dip dinner I prepared and this salad was really amazing and was perfect to complete our meal. I love how tasty it is with the lime and garlic. I went overboard on the garlic and it really made it tangy and good. Thanks for posting this delicious recipe. I will be making it again and again! Yay, Cindy! I’m so glad you’re enjoying the coleslaw. I made this to use with fish tacos, and I added a red onion, just because I like red onion and I already had one so, why not? I almost didn’t have enough for the tacos because I took one bite to taste test and ended up eating half of it right there on the spot!! This is my new favorite coleslaw recipe. Thanks for sharing!! I meant to give this 5 stars!! It’s great, I promise! Thank you, Marjorie! I’m so glad you liked the slaw! I am making this to eat thrrought the week. How many days do you think it will stay good in the fridge? eHey Lauren, It will keep for 3-4 days. It will get soggy before going bad. I LOVE this slaw! I made it to top some Chorizo Tacos. I followed the recipe exactly as is, and did omit the optional red pepper flakes because I had enough heat from the Chorizo. I made an avocado crema to go with the tacos, which perfectly balanced out the slaw and spicy chorizo. I love the dressing and will make that again to top a Mexican salad. The slaw will also pair well with a pulled pork sandwich or chicken sandwich (as you recommended). Yum, Vera! What an amazing combo. You’re making me hungry ;). Hey Katrin, Yay! I’m so glad you’re loving the slaw. loved the slaw; my family of 6 gobbled it up! thanks for sharing! Hey Allie, I’m so glad you’re enjoying it! And your family, too! 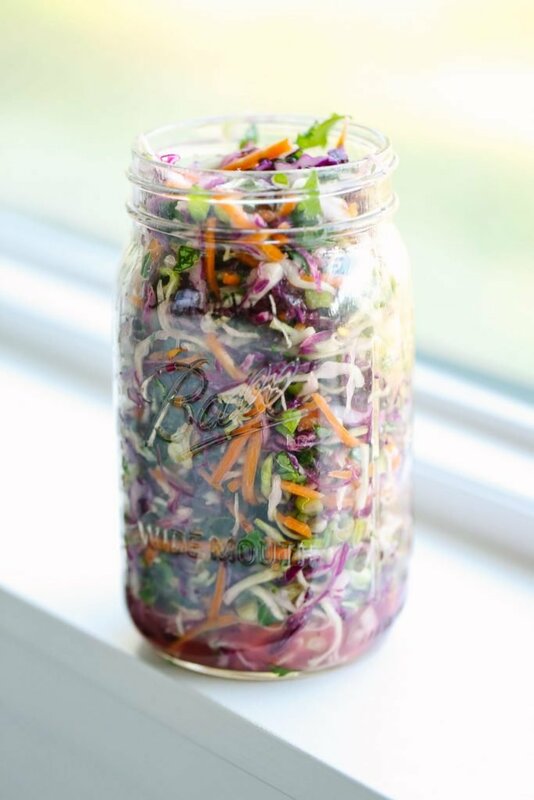 Have you ever used prepackaged coleslaw? I hate to do it but feeding a crowd and having a crazy weekend! Yours looks way better…but was wondering if anyone has used the package? Maybe add a little more carrot and of course the cilantro and green onions? Hey NE, I haven’t, but I definitely think you can. I would just add cilantro and the other ingredients not used in the mix, as you mentioned. Just thought you should know that I & maybe others are having trouble pinning your recipes directly from the page they are written on. The only way I can get them is if I go to all your pins & search for it & that just takes way too long! Thank you for sharing, Candee. I’ll take a look at this. Can you pin from the first image. You could be able to click on the “pin it” words on the first image? Thanks! I tried that & it worked, but all the other Pinterest icons don’t work. I will just have to try to remember to look for the pin it on the 1st image of each recipe. Hey Candee, Glad that’s working. Which icons don’t work? We will be sure to get these fixed. The top left-hand corner of each picture has a red rectangle with the Pinterest “P” symbol in it & the word save. When I click on this it goes to pinterest & appears that it is going to work & then I get a message that the recipe wasn’t saved. Ah, good to know! Thank you. We’ll get to work on this. So delicious! Very refreshing combination.